I have a great appreciation for the outdoors and get out at every opportunity. I am a three-season, learning to be a four-season backpacker and year-round hiker. Currently, my trips are two to three days long as well as an annual week-long trip. I utilize the abundant trail shelters in my locale and pack a backup tarp-tent. I like to cover big distances while still taking in the views. I have lightweight leanings but function and reliability are the priority. I mostly travel woodland mountain terrain but enjoy hiking beautiful trails anywhere. The photo above shows the games from the upper left moving clockwise are Chinese checkers, Reversi, chess, cribbage, Mancala and checkers. The Outside Inside games are compact, packable, scaled down version of classic board games. They are made to be easy to carry and play in outdoor or away from home setting. All parts and pieces are self contained within each game. 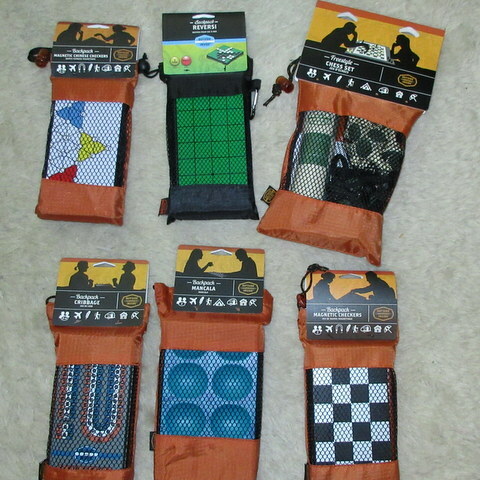 Each game is held in its own nylon and mesh bag with drawcord closure. The game boards fold in half storing game pieces inside. The boards open with a simple latch on one side. The exception is chess. The chess board is a flexible, foldable or rollable sheet of silicone. The chess pieces are held in two mesh bags. Stored inside their bags the smallest games (cribbage, Reversi, and both checkers) measure approximately 3.5 x 7 in (9 x 18 cm), the largest (chess) 5.5 x 8 in (14 x 20 cm) and Mancala is 4 x 8 in (10 x 20 cm). I like that each game is easy to identify through its mesh bag. Additionally all necessary parts being fully contained in one easy to grab-and-go bag is very nice. The boards are easy to set up and all pieces are nicely made. Each game includes brief and easy to understand instructions in English and French. I already knew how to play all of the games except Reversi. I read the instructions once before playing and then again while playing. This was enough to explain the games to my kids which they picked up quickly as well. Upon receiving the games we grabbed Mancala and took off for a favorite hike. The drive to the trailhead is 45 minutes. This very first use was both a great success as well as a minor failure. Usually the kids (9 7 11) are approaching boredom halfway there. However with Mancala in tow they were occupied the entire drive. This proved the game a success. The pieces are quite small and in scooping them up the kids lost one in the car. Mancala and chess are the only two games without magnetic boards. I was saddened that we lost a piece on the first play. Alas on with the hike, we carried Mancala to the summit and played a few rounds there. Again the kids interest was held and we were able to enjoy the summit views for twice as long as usual. Even with a missing piece we simply substituted with a small pebble. An enjoyable car ride and more time atop a favorite mountain make Mancala a success. Between my wife, kids and I we played the other five games over the next two days. I always enjoy a game of chess. My wife likes playing cribbage and my kids can play many rounds of checkers. So the kids found Chinese checkers very enjoyable and we all liked learning and playing a new game of Reversi. All the games are easy to pack and carry with all pieces securely held within the playing board or mesh bags. They are easy to set up and play in a small area. The magnetic boards are particularly nice for playing on less than flat surfaces. I can foresee each of us grabbing our favorite to pack on our next camping trip. All six games are fun and cleverly scaled and packaged for outdoor use. I enjoy playing them and the extra degree of engagement they provide my children. I really like the magnetic feature for keeping games pieces in place. I wish this feature were part of the Mancala board as well. However finding a suitable "trail piece" is added fun. So far the games are an entertaining addition to our hiking. I am eager to see how they fit into or change our camping and overnight backpacking experience. The family and I packed a different rotating selection of four games on several different outings. We made a car camping trip in the fall. There were four hikes to catch the autumn leaves. We cross country skied to a cabin. There was a long weekend trip with downhill skiing, a bushwhack snowshoe and Nordic backcountry trail ski. Games were played in the car, on mountain vistas, in a tent, in a backcountry cabin, warming hut, on a bench, rock and in a mountain side ski house. The games helped mix and shift the focus of all of our excursions. It wasn't just about reaching a summit, view point or a certain number of miles. Now it was who would play who at which game, finding a suitable spot to set up the games and most of all who won last time and who would win this time. This made things more engaging and enjoyable. The time in the car on the way to hikes and trips was less monotonous and passed easier too. Some games blended better in some settings than others. Chess and cribbage were better suited when we had more time available. These were not so great when taking a trail side or mountain top break. 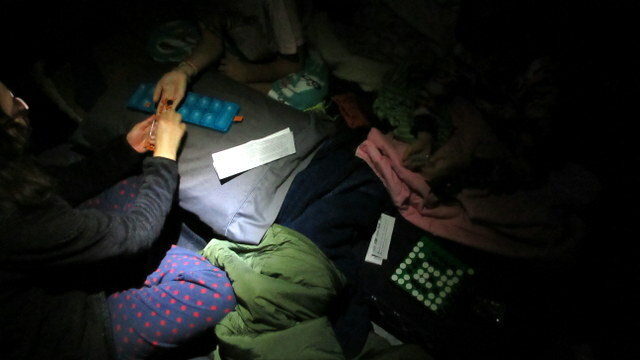 They worked better in the tent, cabin and vacation house during leisurely evenings with more downtime. Chinese checkers, mancala, reversi and checkers games take less time to play. They work nicely when taking rest and snack breaks outdoors. The games are light enough and pack small enough that we always had room for several among the four of us. We managed to not lose anymore pieces. All games held up to all the travels, miles and cramming into packs without breaking. The Outside Inside Games helped make all our family trips more fun when played outside or inside. The size and weight of the games make them easy to pack along on day hikes or overnight car / basecamp style adventures. My family and I will enjoy these games on many outings to come. This concludes my Long-Term Report. I would like to send my appreciation to Outside Inside Games by GSI and BackpackGearTest.org for making this test series possible. This report was created with the BackpackGearTest.org Report Writer Version 1.5 Copyright 2019. All rights reserved.